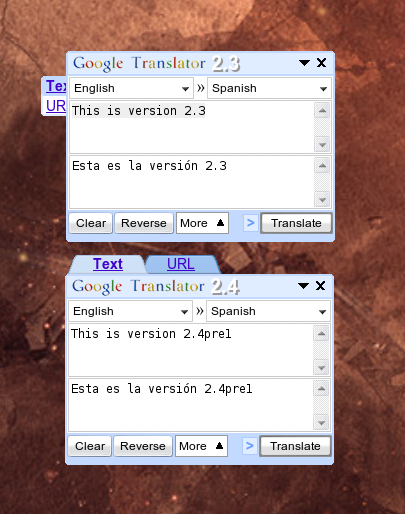 I’ve spent some time today improving my Google Translator widget for Opera. You can find the changelog here, but I’ve uploaded a screenshot of the tab changes that I made. Basically, I just made it follow the layout of the Google Chrome browser a little more closely. In version 2.3 I was going for more of a Gmail design with the folder style, but it was difficult to work with since I had to make it hide a little to make more room. This change will actually help me with my next big feat…making the widget resizable. I’ve had a lot of good feedback on this widget with over 114,000 downloads (currently at 114,174). The one feature request that continually comes up is for a resizable version. Unfortunately it’s not as easy as one might think so it’s taken some time to change my code. It’s been completely rewritten for a third time now as each time it becomes more and more optimized and fluid. I’m hoping to satisfy everyone with v2.5 which should be the first resizable build so stay tuned. Next Next post: Cleaning my laptop..